PMC Twenty5.23 5.1 review | What Hi-Fi? Having spent three years listening to PMC’s Twenty 23 5.1 speaker package as part of our reference kit, moving to a new home cinema room has afforded us the opportunity to upgrade. We are now the proud custodians of this glorious new Twenty5.23 5.1 system. The range celebrates PMC’s first quarter of a century, in which time it has become one of the mainstays of the premium domestic speaker market. Comprising two stereo pairs alongside a centre speaker and sub, the stars of our new reference speaker package are the Twenty5.23. They have already proved popular, and it’s easy to hear why. The Twenty5.23s act as front and surround channels in this set-up. Standing just over 90cm high and 16cm wide, they are compact enough to fit into most rooms without intruding. That’s an important factor, and it's a trait shared by the whole package. A product might sound brilliant, but if it can’t fit into a domestic environment it won’t even make the shortlist in most cases. PMC understands this point better than most. It’s not just the size, either. These are smart-looking items. Some may find the metal detailing a little showy, but the 23s look more like luxury furniture than the typical floorstander at this sort of price. Our samples are beautifully made and, everywhere you look, from the crisp cabinet edges and nicely machined stabiliser bars on the base to the lovely single-wire terminals, these PMCs are finished with care. While they may resemble the much-admired Twenty 23s, the only things carried over are the screws that hold the tweeter. 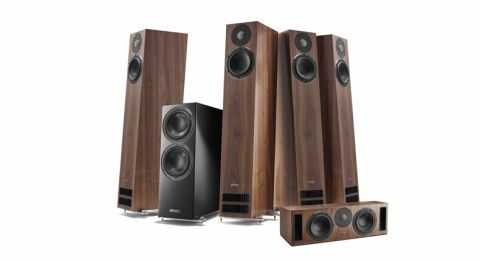 The Twenty5.23’s cabinet retains the now-established slanted look, but the company has done a lot of work to make it as solid and low resonance as possible. The most obvious change is the move to metal stabiliser bars, rather than the full-size plinths of the Twenty 23s. As before, PMC uses isolating rings between the base of the cabinet and the spike assembly to provide a degree of decoupling the company feels aids sonic openness and detail. The drive units are all-new. The 27mm soft dome tweeter is co-engineered with OEM supplier SEAS - it uses a Sonolex dome and is designed to deliver smooth, insightful sound with wide dispersion. The latter is something that’s helped by the protective grille too. PMC has long been a fan of paper cones, but for the Twenty5 range it has moved to a material called G-weave – a resin-bound, fine-weave glass fibre and pulp hybrid cone material claimed to deliver improved rigidity without adding too much character. The 23s use a 14cm unit, designed with a long throw to cope with large-scale dynamics and high volume levels. Its chassis is made of cast alloy and designed to be as open as possible, to minimise any impedance to air-flow as the cone moves. A PMC wouldn’t be a PMC without the use of transmission line bass-loading. A transmission line is a folded path built into the speaker cabinet that takes the rearward sound from the mid/bass unit and absorbs all but the lowest frequencies. These bass frequencies exit the speaker through the mouth on the base of the front panel and augment the drive unit’s forward output. The company has used this technique since its earliest days, and it remains one of the features that differentiate its products from the herd. The big advance for the Twenty5 series is the addition of what PMC calls the Laminair vent. This is the fancy finned structure clearly visible at the mouth of the 23’s transmission line, and it’s designed to smooth the way air flows out. The claimed advantages are less noise, faster response and better low-end definition. That’s how it turned out when we tested them as a stereo pair, and they’re predictably adept as part of a 5.1 system – or the 7.2 (additional 23s for surround-back channels and an extra sub) we’ve taken for our reference package. As you might expect, PMC has applied this technology to its centre speaker as well, while building in two of those 14cm mid/bass drivers straddling the same 27mm tweeter. Similarly slim, the Twenty5.C has been designed with wide, even dispersion in mind for least effect on performance whether it’s being positioned high or low. Finally comes the Twenty5.sub, the unit that most belies its slender image. Benefitting again from PMC’s new Laminair technology, its 400W Class-D ultra-low-distortion amplifier and dual 17cm bass drivers can deliver frequencies down to 22Hz with startling honesty and precision. Combined, the character is not dissimilar to the Twenty package that proved an instant hit in our previous testing room, only with performance that is improved across the board. The most important aspect has always been delivering speech, and an added level of detail and dynamic sensitivity is immediately recognisable in the Twenty5s. Subtle inflections retain their delicacy while being better outlined. The greater insight and texture make this one of the most lifelike reproductions of the human voice it’s possible to achieve for the money. As with the previous package, this is aided by the solidity of the bass and lower midrange, which gives the presentation ample body without any muddying or softening. In fact, the Twenty5s are an altogether punchier and more agile set of performers – right down to the depths of the low end offered by the sub. It rumbles rather than hums, delivers staccato jabs rather than ham-fisted hooks, and keeps pace with blockbuster action as easily as it does with even the most rhythmically imposing of soundtracks. Of course, a lot can go wrong when you change so much of a successful speaker’s make-up, but we’d have been surprised if the Twenty5s had lost their predecessors’ superb sense of timing. Far from being overly regimented, these latest PMCs continue the brand’s tradition for rhythmic intelligence, remaining composed with anything we throw at them. But most of all, this speaker package is a whole lot of fun. It’s serious and appropriately analytical of its source material, but the punch and drive keeps us watching through to the end of even the most heavily used of our test discs. Usually it would take a great deal of deliberation before parting with a budget of more than ten grand, but we’re struggling to imagine another such purchase we’d make so promptly.